Our community gardening project began in 2012. That year, with the support of Carrot Cache, among others, our head gardener Laurentiu coordinated the tilling, planting, nurturing and harvesting of our first organic garden. 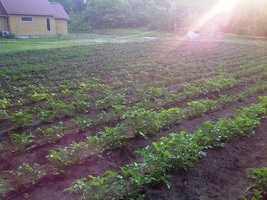 2,400 seed potatoes were planted and 15 tons of potatoes were harvested. 75% of the labor involved was by volunteers of all ages, from 5 through 75 years. The harvested potatoes were used by an inner-city mission in Toronto for its meal program, as well as by those who used the services of the Refuge itself. In 2012, we learned about the quality of the soil, the natural environment, local experience and contacts in the area and beyond in regard to organic gardening. Our project is unique because it establishes a long-term garden where anyone can experience the joy of riffling the earth through their fingers. It brings people together in a wholesome and genuine way, creates and sustains communities. For rural people, the community element is important as they tend to have fewer social services available and can become isolated. For city people, connecting deeply with others in a safe and organic environment is a rare commodity. Our garden provides education through participation which will be available through retreats and summer camps and other activities. 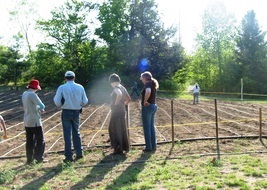 People can come together here to learn about the earth, about day-to-day aspects of growing and harvesting and about the intangible aspects of gardening such as patience and discipline. Our garden creates a keeper of genetic diversity in plants. Our garden is also a place of meditation and contemplation for many people. Gardens are places which promote mental and spiritual healing simply by their very existence. Sitting, walking, or working in a garden promotes inner peace. That's why we have planned the center spot with somewhere peaceful to sit, and the inclusion of flowers and herbs within the actual vegetable garden. In 2013, thanks to a grant from Canon/Evergreen, we were able to plant 250 species of native fruit trees and bushes, including American chestnuts, black walnuts, hazelnuts, apples, plums, cherries and much more. Do you remember our chickens from last year? Or the very early rooster? Our dear Julio was very glad about 2015 that everything produced in the garden got used, nothing wasted. This year we intend to add to our summer stock a milking cow, a pig, two lambs and possibly a donkey. We did not know until very recently that donkeys are the best protectors of lambs. Plus, they can be used for a great number of other tasks that Julio will teach us. If you have not had a chance to work in our garden, please respond to our invitation to join us! Our greenhouse is installed and ready to go. 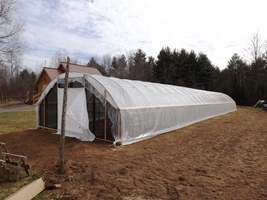 Thanks to a generous and kind donation, this spring we were able to set up a greenhouse to extend our growing season. Massive thanks to Laurentiu, Leo and Ruth, and their team of volunteers who worked over-over-overtime to have us ready by the end of April. 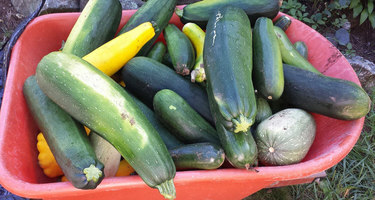 And, thank you to all who helped bring bountiful harvests from our garden at St. Mary of Egypt Refuge. It was the end of January, and the wind made -20°C feel like -35°C. One could hardly believe that trees and vines and fields would bloom again in the spring. After an amazing 2013 in our garden, we hoped and prayed it was going to happen again, so we were preparing for Saint Phocas garden by ordering the seeds needed: 3,600 beans, winter butternut and buttercup squash, amaranth, corn, tomatoes, beets, eggplant, carrots, zucchini, cabbages, radishes and lots of enchanting herbs. Did you feed grass to our happy chickens at the refuge this year? Did you eat the orange yolk eggs that they produced during the summer? Or maybe you just picked and ate a few veggies from our garden. If you answered yes, we thank you for sharing the joy of being together at St. Mary of Egypt Refuge. If you did not have a chance in 2014, as the gardeners say there is always next year. Thanks to you, it was possible for many of us to feed ourselves from our own garden and to bring produce into the city. This year we planted only heirloom seeds, so we can save and use our own seeds in the years to follow. Ever wondered how many beans one healthy plant produces? Our winner this year was a Jacob’s cattle bush bean: 100. For 2015, we are thinking about adding a new companion beside chickens: a sheep or two lambs, a goat, a cow, a donkey. Let us know what you would like to see next year. Thank you all for the wonders of 2014 in the garden. The fruit tree plan worked beautifully this fall: two rows of eight apple trees ten feet away from the laneway, brought all the way from Siloam Orchard. Our small little orchard of Mother, Swayzie Russet, Blenheim and Snow, close to the pelegrines of Saint Mary. We delimited with some tall poles/ropes so that Dave does not push snow over the trees. Julio and Olga make a very good team and Laurentiu started to learn a bit of Spanish too. We did our little part, and the rest was in God's hands. The bridge looks nicer in its place. We took a walk on the other shore and thought about fishing from the bridge, but it was too windy and we already had brought Arctic fish from Toronto. One Saturday morning we went to the chickens, hoping to find at least three eggs for our breakfast. Julio was very glad that the chickens recognized him (he did not come empty-handed, but with some fresh grass and veggie leaves), and I was glad that Thursday (the dog) eventually recognized us and let us out of the car. As soon as I walked toward his bowl of food to replenish it, he became very friendly! Olga and Julio prepared a feast lunch with amazing dishes, and we skipped dinner. Sunday we went again to the chickens and they gave us another dozen eggs. We were very grateful to them. Thursday the dog was glad to see us, especially after the cats ate his extra food. We stopped in Belleville at Agia Trias Church and were glad to see Father Anatoly and his congregation. His blessing went a long way. Julio, Olga and Laurentiu thank St. Mary of Egypt and her friends for another chance of a fruitful weekend. On the first weekend of October 2013, we planted about 220 trees and shrubs at St. Mary of Egypt Refuge, with the funding provided by Evergreen Foundation and Canon Corporation (a photography company that also provided us with a camera). The goal is to provide edibles to augment the vegetable garden’s produce. In addition, many of the selected fruit and nut species are native to Ontario; so this planting provides something of an interface between the goals of providing fresh food for the inner city and the protection of Ontario’s biodiversity. We were few workers, but Providence was looking after the Refuge. When one of the nurseries provided enormous (two-metre tall) trees that could not be transported by car, Laurentiu was able to provide a trailer. The trees in question were the endangered American chestnut (Castanea dentata). This tree was almost wiped out by an imported disease, chestnut blight, about a century ago. 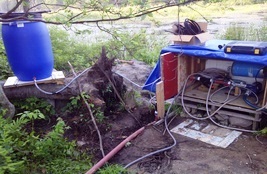 In recent decades, propagation has focused on trees that have shown some resistance. The Refuge is outside of the historic range of American chestnut yet, being on the southern part of the Canadian Shield, has ideal habitat conditions: well-drained, acidic, sandy or rocky soils. The tree should be fully hardy here, yet out of the reach of lingering blight spores that may float around its original range. Four were planted: two in the vicinity of the main house and two near the northwest edge of the vegetable plot along the entrance driveway. In addition, numerous other native and cultivated species of fruit and nut were planted by Julio and Fr. Roberto, who had to work extra hard because of the low staffing and a back injury which prevented me from actively digging and lifting. Fortunately, the soil was soft with recent rain and all planting was done by Saturday mid-day. The weather was mild and the rain abated during the planting times. The native species planted included: white oak (Quercus alba), grown from acorns collected from old-growth relict trees in downtown Toronto (Queen’s Park and Casa Loma areas) that existed before the city did; shagbark hickory (Carya ovata), wild crab-apple (Malus coronaria)—suitable for jellies, elderberry (Sambucus canadensis), smooth wild rose (Rosa blanda) and American hazel (Corylus americana). Cultivated types included blueberries (probably originally derived from native species) and black currants. As a bonus, and somehow added in, were a few hydrangeas that were added to the vicinity of the playground. The project is not yet over: some apple and sour cherry varieties not yet available are to arrive in 2014. We started 2013 garden season a bit early in the year while the field was still white at St. Mary. On the first trip our car was heavy from the sacks of compost transported in the trunk and while I was glad that I found my lost keys and we can remove the potato sprouts I managed to get the car stuck in the mud a few yards away from the church. Peter and Lucas were in the back seats and after a few minutes of trying to get loose, the car sunk even deeper in the mud. While I was Glen Roy thinking “Oh boy, this is not a good!” I looked at them and they did not seem to want to get out of the car so I suggested them to start praying so we can go home. Radu, co-gardener, advised us to open the trunk and remove the sacks. I remembered about L’Esperanza ship that got rid of the gold sand sacks to escape the rocks. Radu, multi-qualified and on the spot irrigation plumber took some wood boards and put under the front wheels and out we went. I turned to the kids and told them gladly: “See, if you prayed!” Lucas answered me he did not pray. Peter seemed rewarded. This was on March 30, 2013, by that time the garden was plotted and some seeds already growing at home by Linda and Sophia. After that there were a few trips and many hearty volunteers helped us in the garden and mostly our humble Julio who delivered many tens of pounds of dry, almost sacred, romano beans for pasta fazzouli and who is ready to grow chicken next year (haven’t decided yet about the rooster). This year was bountiful in St. Phocas garden at St. Mary of Egypt refuge. On September 28, Baba Zivka, Dorothy, Chris, Aaron, Eliana, Tania and Julio filled the church basement and freezers with multi-variety squashes, tomatoes, green beans and dry beans, beets, ground cherries, potatoes, green tomato (traditionally pickled by Mariana and Ionel), pickled cabbage, carrots, onion, eggplants and even okra. Father and Julio, with a last stretch, scooped even more potatoes on October 5. Not too long ago, people were almost worry-free, having enough food to go through the winter. We started with a few handfuls of seeds, early this spring and these days Julio is cooking delicious soups at St John the Compassionate with organic, local and thrice-blessed vegetables from our garden and will do so, maybe, all the way to our Pascha. 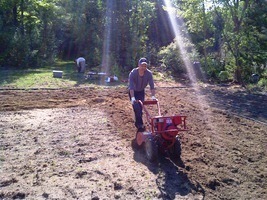 Father and Julio seeded the garden with winter rye to protect the soil and to keep it green. I have recently heard, from Father, this word: reverence. In the meantime Julio is bravely keeping away from our garden all chewers. I just got word that the deer fence is up. This year Aaron dragged to the field the best poles one could find: cedar trees. Aaron’s planting experience and zeal showed in the fields closely seconded by Eliana, Aurora, Taylor and Owen. Gavin led our efforts in the native species area, around the chapel where Professor Paul and Jesse made it look like a garden. I almost forgot Johan, who took great pictures and cheered everyone by sharing them at night. And not last, Mary, who quenched our thirst with best water and juice. Oh, and our wheel barrow master: Steve, who found and carefully delivered all the plant trays. Special thanks to all the children who joined us in the garden and participated in the Divine Liturgy and in the expedition to the other shore, all the way to “Four Cow Meadow” and back. The magnificent: Maria, Agnes, Solomon, Philomena, Barbara, Eliana, Sophia, Alastair, Peter and Lucas. And our canoe sound speed deliverer: reader Michael. The gift of the Divine Liturgy was offered to us in the first day of the week by Father who was accompanied, very early in the morning, by Theodor, Haroula, Maria, Michael, Christina and Bernadette. What a gift! Anyone experienced the unique, rich quietness of the fields in the country, rarely interrupted by a few words? Come and hear! Thank you all for making this possible in the garden of our refuge. Laurentiu is an organic gardener who develops computer programs for a living. His love of gardening comes from his ancestors on whose fields he practiced agriculture while growing up. In 2012, with financial help from Carrot Cache and volunteer involvement of many people and Laurentiu as head gardener, St. Phocas garden took life at St. Mary of Egypt Refuge’s establishment. He and the people working there received more joy than in many past years; therefore in 2013 with the participation of even more people, Laurentiu and Linda led another blooming project: St. Phocas garden grew a much larger variety of summer and winter vegetables. Naturally, as in the past, Laurentiu’s sons, Peter and Lucas (who, by the way, want to be farmers), got involved with all their energy into this bliss. Laurentiu is actively pursuing his gardening call and enriches his knowledge by participating in 'agri-webinars,' focusing especially on soil nutrition. 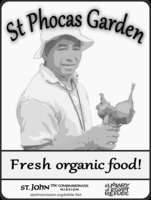 He is carefully planning the activities of future seasons around St. Phocas garden and hopes for the best organic vegetables that will bring joy to many people.